Do it! You are smart, witty, and write better than most and gosh darn it people like you. I have bought lots and lots of how to books or pattern books that pretty much sucked, but if I got even one idea or inspiration out of a sucky book I did not regret the purchase. People buy your ideas for lots of things and use them successfully, so much so they come back for more. (me included cause you always have fabulous ideas) Why would a pattern book be any different? Well it would not be any different! As long as you put your personality into your book, be yourself and let you shine and I know you will have a success on your hands. I may be your mother and by definition your biggest fan, but you know I call it as I see it. Remember my famous line, "I don't like you right now, but I always love you". Just because I am your mother does not mean I can not be objective, just as the famous line indicates. If for an instant I thought you would not be successful doing a book I would not set you up for a disappointment. Hey would I want that to reflect back on me? The answer there is a big old NO. Seriously, don't worry about anyone but you. If you want to do it, then do it. Think of how you would talk to your class, they eat it all up, and then put that into your book. I am very impressed with your writing....and your ability to describe the human condition! How would it be any different than publishing your patterns on Ravelry? Do you really think a book would be different? It's done already. Again, more encouragement than I could have asked for. Here's where I had to laugh. I'm laughing because in a flash I've learned how foolish my initial fear was and how many serious things there are out there to actually have fear about. Such as my biggest fear of the moment - the collaboration. Why am I afraid of the collaboration you ask? This one is crazy easy to answer. MONEY. (Doesn't everything boil down to money?) Should my co-writer and I part ways prior to or during publication and when we inevitably part ways after our publication, who owns what? Who gets paid what? People are weird when it comes to money. It is a law of human nature. Fortunately, she is wonderful and agrees wholeheartedly that we need to plan our "divorce" before our "wedding". See what I said there? Neither of us are saying "Oh, don't worry. What could possibly happen?" Watch out world. Two smart chicks ahead. Beware. We are both really excited about our collaboration, and even if this particular project doesn't take off, I fully expect we will work together on something. There is an amazing magic that happens when you find a creative mind that you can really click with. We brainstormed last night from the initial concept seed to serious outlining in a very short period of time and it was breathtaking and exciting and scary and overpowering. Now we just have to figure out if we are as compatible in our ability to "break up" as we are when we work together. I suspect this is something a lot of artists, designers and creative collaborators fail to do. Like falling in love, it's really really easy to get sucked into the joy and excitement while ignoring the more serious aspects. Life, or at the very least business, would be a lot easier if we all planned our divorces first, then fell in love. I suspect my next major fear will be the lawyer's fee, immediately followed by the hospital bill for the heart attack. Oh, and just in case you were wondering, nothing is getting shelved. I waitressed I can juggle crazy amounts of stuff on a plate. Why would it be any harder to write one book than two? If you are laughing, you better be posting your experience in my comments or email and trying to save the foolhardy. Recently I've been hearing more and more requests and encouragements for me to publish a book. I find it all very flattering and terrifying. I won't lie. It is a dream of mine. I'd love to publish a book of patterns. I'd love to publish a book with slightly altered (for privacy of course) tales from my sit-com life. Who wouldn't? And then in the same breath I'll tell you "Oh, No. Not me!" Now don't start. I'm not grubbing for compliments or encouragement. Really. I'm just sorting out my fears. When I told my husband about some recent encouragement I'd gotten and told him I wasn't sure, he paused a moment, accessing me, then asked "What are you afraid of? Are you afraid it won't sell?" Reason #16,325 for loving this man. He knows me. He supports me. He is the best part of me. I laughed. He had pointed out something he knew I didn't fear, thereby forcing me to look into the dark toothy drooling mouth of the monster and blurt out the truth. I'm afraid it will sell, but people won't like it and will regret buying it. That is the brand failure I fear. Facing your fears is supposed to eliminate them, right? Mostly. I think in many cases, this is true. I also know, that in my experience, killing one sounds off a war cry and thousands follow and attempt to take it's place. I am highly skilled at sounding this invitation. I can dig up a new fear in the presence of all encompassing warmth, light and unconditional love. I am, without a doubt, a master of fear. I am, also, not alone. There is a wonderful book out in the universe called "Taming Your Gremlin" by Rick Carson. (Rick, if you're using Google Alerts - smooches! I've had this book for years, and well, there were a lot of them, but the pile of dead is greater in number than the field approaching. Thank you. I've recommended your book to countless and continue to do so.) I'm pretty sure you can download it to your e-readers thru Amazon. The general principal of the book is to 1) identify that little voice that shames us, reminds us of past or perceived failures or provides us with no-win scenarios that eat so much of our bravery and time that we simply give up, then 2) tell that Gremlin to shut the hell up/ignore him/her until pop! that Gremlin dies and we no longer live in the Gremlin's circle of fear. Another amazing resource for insight into the things that hold us back is Brene Brown. Her book "The Gifts of Imperfection: Let Go of Who You Think You're Supposed to Be and Embrace Who You Are" as well as her TED Talks were brought to my attention by my dear friend Bob. Her book is available for digital download thru Amazon. (Brene, if you're using Google Alerts - hugs! Thank you for putting the word "shame" back into my vocabulary and teaching me that it doesn't define me nor should it dis-empower me. I'm embracing ME, defining ME, and falling in love. Thank you.) Her title says it all. We hold ourselves back with false definitions of self and impossible visions of fulfillment. Why do I mention these resources? Because I know I'm not alone. Because this whole idea of writing a book reminded me that I killed that Gremlin, that I faced the fear of being "the only one", of being alone. We all have fears. If we don't, we're dead. It is a human truth, regardless of whether you're skydiving, going out on a first date, baking your one-millionth wedding cake, teaching a class, getting in a car, casting on a new knitting project or considering writing a book. Fears actually do protect us and some are entirely rational. But we don't have to fear being alone in our fears. You will find that when you think you are alone, there's usually someone thinking the same thing next to you. Realizing that I was afraid of someone else's purchase satisfaction - something COMPLETELY out of my control, made me realize that I really had nothing to fear. If I like my work, if I do my best and am proud of my accomplishment, what does it matter what anyone else thinks? What, really, are the chances I will be alone? And if in fact, I am alone and no one else likes my work, I'll bet dimes to dollars there will be one other person out there having the same experience and we will stand tall next to each other, proud to be in the company of the only other person in the world whose work is detested by all. See? Even when you expand on it, it is absolutely a ridiculous fear. The numbers simply aren't there. Bad Math. What is your fear? Have you got a pattern, a book, an idea that you would like to express to the world that is being halted by a fear? Are the words "not good enough" still in your vocabulary? Bring it! Add to my proof pile. I am not alone. Neither are you. We have all been it's victim. We have all paid to be it's victim. What is this horror of which I speak? That yarn. That one stunningly beautiful yarn. That skein you had to have. That skein of gloriously colorful defiance. That teasing ball of temptation that absolutely refuses to look even a third as glorious knit. No pattern fulfills it's potential. You know. You've tried. them. all. You noticed that something about it was different when you wound it into a ball. Something changed. An amazing colorway was suddenly transformed into noise. The colors were suddenly too busy and the repeats too short/too long/too something you just can't put your finger on that makes every project you attempt a failed web of pooling or muddled dullness despite the skeined glory it once was. And so it sits. It's in your stash. You might have even re-skeined it back to its original beautiful state in hopes of fooling yourself into believing it still has potential. Have you noticed? Your stash has a shame drawer. It's most likely full of these One Skein Wonders. One Skein Wonders refers to a couple of different yarns actually. It refers to "I wonder why I only bought one skein" as well as "I wonder what the hell I was thinking planning on doing with that?!?" and of course, the topic of this article, the "I wonder if I'll ever be able to make something wonderful enough to fulfill this skein's potential". I know people who adamantly refuse to stash for just this reason. They don't want to acquire a drawer of shame. 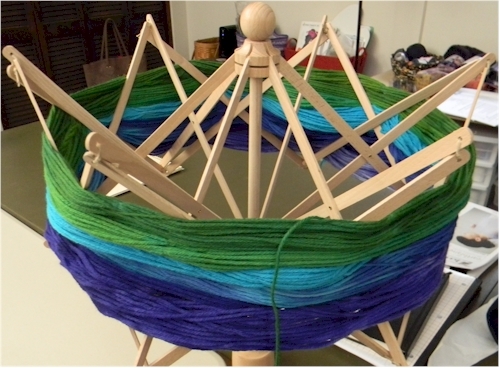 On the other end of the spectrum, I know people who avidly build stashes of nothing but one skein wonders. They are, of course, wildly talented color/texture visionaries who make amazing garments of the broadest spectrum of un-repeatable yarn collections attainable only by pack-rats and artists of their caliber The rest of us fall in the middle. Some of us gift-away these troublesome fibers. Some of us dedicate huge blocks of time to finding that perfect project. I'm of the mind that these skeins are actually produced in cooperation with papermills hell-bent on forcing me to buy reams of paper onto which I print downloaded patterns doomed to fail these skeins and guide me one step closer to a home-office inferno. Have you ever noticed that if someone presents you with a plight, a problem, a ridiculously impossibly seemingly simple problem like getting a square peg to fit into a round hole that you suddenly have 5,000 solutions for them. And then, have you noticed, as you swagger away with coupons of life-indebtedness in your clever little paws, that you had the answer you needed for your monster dilemma all along? That in removing the splinter from your friend's eye, you removed the timber from your own? Yup. Last Wednesday in fact. A new knit friend showed me her one skein wonder. I recognized it for what it was immediately. 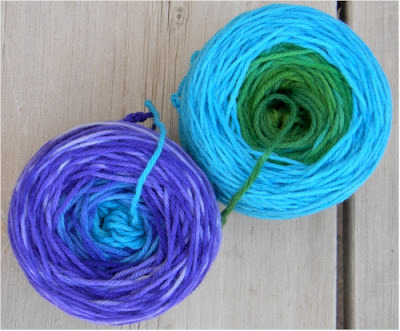 Vibrant colors in short repeats on lace weight - the impossible skein. Gorgeous in skein format, a muddied ball, and a pooling lace with little exuberance remaining. And then I said the words: "Oh, carry it along with a thicker black so that it runs as a colored highlight. Frame the center spine lace chart by doing a column of slipped stitches on either side, carrying the colored lace weight in the back so that only black is worked. It'll give it a neon / stained glass effect." A moment of brilliance. 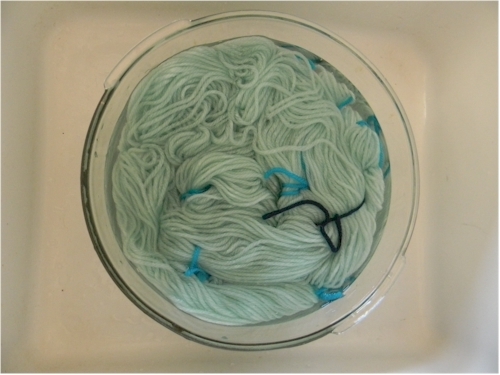 A textbook technique for handling a "novel" fiber. Regurgitated. Revered. Pause for effect. Head smack. Epiphany. Maggie - thank you for waking me the hell up. You handed me the prompt I needed to find that tree in my forest. Smooches Babe, and a High Five! And now I call YOU out. What other techniques have you used or heard of for handling One Skein Wonders (as defined above and in no way referencing the book by similar title)? An acquaintance coined the most interesting new term the other day: lace face. As the story goes, she's taking a lace class and had to miss the first class, so the teacher has been working with her via email to bring her up to speed. She had been writing an email to the instructor with questions, and her success report to date, and started to explain how she was still getting her "sea legs" but obviously that term just didn't seem appropriate. Instead, she started to type "lace legs" and, not liking the sound so much, re-worked it over to "lace face" stating for the teacher that she was "getting her lace face on". When she told me about this, I fell in love with the term. It's perfect. I experience "lace face" all the time. In fact, I think 'lace face" actually has four stages. First I'll begin to the stage Betsy was referring to when conversing with her instructor. When you're working on multiple projects, sometimes it takes a couple minutes when switching from one to another to get your groove back on, but never is this more true than when you've been working a "tv" or "take-along" project full of mindless knitting, and jump over to a lace project. There is a different rhythm, a different part of your mind that has to activate, and the contrast can take from a couple of rows to a chart repeat to adjust to. You've got to get your game face or "lace face" on. I regard this as a "stage three lace face" in which the conversion is quick and primarily painless. "Stage one lace face" occurs most often in the classroom. I see it when I'm teaching. The classroom version is different because more than a state of mind, it refers to the slightly greenish pallor, tinging blue from oxygen deprivation new lace knitters get as they white knuckle their needles, squinting at charts and swearing under their breath at the seemingly savant instructor who smiles and flits about the room saying encouraging things like "soon you won't even need stitch markers" with the bravado of annoyingly quickly acquired expertise. This stage of lace face will advance to the other stages... it's merely the slow-motion version of the conversion from the leisurely knit/purl to the rollercoaster k2,yo,k2tog,yo,skp,yo,k2 experience. In stage one, the mind is working very hard and slow to write the new muscle movements, eye coordination and life saving breathing techniques; it is learning to make the adaptations necessary for being "lace ready." 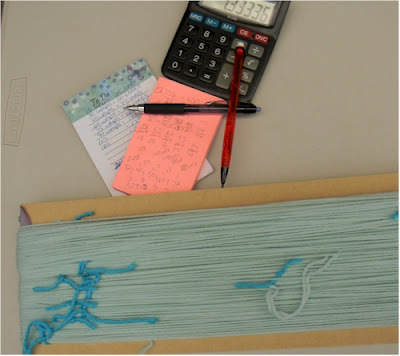 "Stage two lace face" can be a permanent lace knitting stage for the occasional, however accomplished lace knitter, or it can be a brief period of pre-mature self confidence in the classroom. Stage two is without question the most humorous stage for the observer, knowledgeable in knitting or not. This is the period in which we think we have our "stage three lace face" on, when in fact, we are still drifting in our minds back to a more leisurely automatic rhythm that guides our hands to make rows of pretty stitches in no way related to the pattern we are trying to accomplish. Stage two lace face is most often marked by a reddening of the ears, pinching of the mouth, heavy sighs, colorful blasphemes and tinking. This is what gives your knitting instructor her swagger. It means you're getting it and that light bulb is on the verge of trading its flicker for a blinding glow, marking not only your successful comprehension, but the elation teachers feel when a student assimilates their lesson. Jumping back now to stage four lace face: You know her. She's the one in your knit group that knits non-stop from beginning to end, telling tales, laughing, gasping at your real life drama of the week, pausing only to help someone else correct their blunder - kindly and knowingly, all the while working some cobweb fine fiber in some multi-chart lace pattern she memorized! which isn't even present for reference! and never makes a mistake. She has achieved the "lace zen" - that magic place where her mind operates a sub-track that hums a rhythm of increases and decreases whist she's catching the bartender and ordering another round. "Stage four lace face" is the expert lace knitter... the poker face knitter... the knitter who seemingly isn't even aware she is knitting. It is a point of confidence shattered only by over imbibing, fire and the stage two lace face sitting next to her who suddenly goes postal and snatches Zen's knitting off her needles in a fit of frustration. Which level of lace face have you/are you experiencing? Betsy - thanks for letting me steal your term. I'll be using it at my next "terrorize students with lace" opportunity. I'm forever experimenting with dyeing. I love it. It's good fun and the worst thing you can end up with is brown yarn, and I look good in brown, so, no loss. This is my most recent experiment. I teach both knitting and dye classes at my LYS and so to best advertise my dye class, I use hand dyed/painted yarns when I knit along with the students. Having another project class coming up before my next run of dye classes, I was due to pull something fantastic. Here is the result. 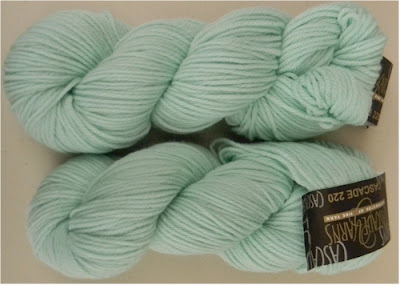 Run of the Mill Cascade 220 in a color that is so not me - Mint. Why did I purchase 2 skeins of Mint you ask? Because I had wild ideas about hand painting this to look like scattered sea glass before I came up with this idea. And because Cascade 220 is a wonderful basic yarn you can do most anything with that takes dye beautifully, has a wonderful hand and is CHEAP. So, Step 1 - Fuzzy Math. I wanted to do a 9 step spectrum working with three dyes over two skeins of yarn to get a vibrant gradient for a shawl. No, I don't know what possessed me. Don't bother asking. To do so, however, the skeins need to be joined into one and divided out into nine not quite equal parts as you ultimately need more yardage for the bottom edge of a triangular shawl than for the cast on/beginning. I tried to do math. I researched, I calculated, I erased, I invented new math and in the end, I winged it. Mostly. I divided out nine sections of increasing yardage and tied each. Small jars from left to right got: 1/2 emerald/ 1/2 emerald/turq, 1/2 emerald/turq / 1/2 turq, 1/2 turq/ 1/2 turq/violet, and 1/2 turq/violet / 1/2 violet. Follow all that? There will be a test. (About now I realize just how ambitious it is to try to prevent 9 sections totaling 440 yards from tangling.) All yarn is soaking up the dye and magic is starting to happen. 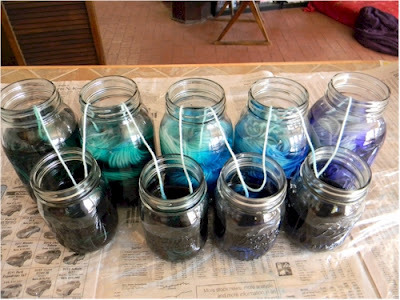 (You should have seen the look on my husband's face when I asked him to help me move 9 jars full of acid dye, linked with a continuous thread of yarn, into the microwave - priceless.) Heat setting is easy this way. Couple minutes on high, rest a couple minutes, repeat until dye is exhausted. Sorry - no photo. Again - delusions of grandeur thinking this wasn't going to get tangled. If you do this - tie, tie, tie. 4 is okay - 8-12 would have been better. I untangled as much as possible and run it out over a dowel. As with any dye project, there were some surprises. Some colors blended, some broke a little, and two went total tie-dye on me. Either way - I love it. Bright, vibrant, unexpected, fun, colorful and contiguous! Love, love, love the colors. Then I began to wind cakes. Love, love, love a helpful, patient hubby! Smooches Babe!! This picture doesn't do the yarn justice. I re-divided the skeins back to two and set both cakes up as center pull so that I can do a continual knit from one to the other. Because the short yardage sections in the small jars are only about 6 yards long (just to blend color changes) they get lost in the cake. I promise to post pictures of the final project, once I figure out what I'm making from this and complete it. Final Analysis: would I do this again? Yes - but differently. 1) More ties. The tangling wasn't awful - really only put about 30 minutes into correcting twisted bits, but it was like being on a rollercoaster in hell during the rinse stage. Like I knew it was turning to a twisted nightmare of knots, even if it wasn't - the stress level was unacceptably high. 2) Either really blend the dyes or don't or plan better. I'm all about surprises in my dying, but now I know I can have more control over placing the tie-dye look or doing a true spectrum. I got a fun mixed bag out of this, but could have gone for a clean blend or full out party. 3) Setup with Future in Mind. 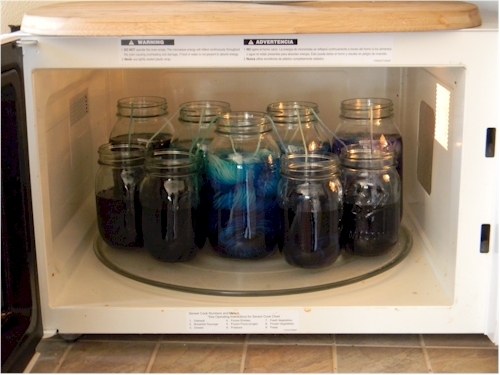 I should have put all dye jars on the microwave turntable tray from the start - it simply would have been easier. 4) Use Less Dye. I'm heavy handed when I mix dye stock because I like vibrant color. On the flip side, this means waste and lots and lots and lots of rinsing. I wasn't able to truly exhaust my dyes - they were over saturated. I'm not a professional, but I play one at my LYS. Have questions about my process or sanity - Visit me on Ravelry here: jesseknits. If you try to duplicate this project, please know, I'm only responsible for boiling over dye in MY microwave, not yours. Dial 911 in the event of a suffocation by tangled yarn emergency. Love those hand-painted yarns? 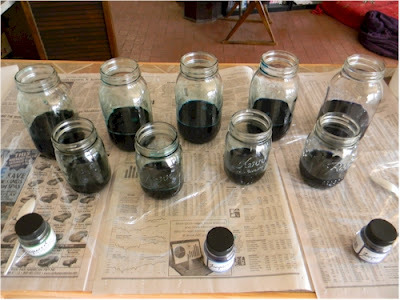 Learn how easy and fun it is to create your own custom colorways using Jacquard Acid Dyes. 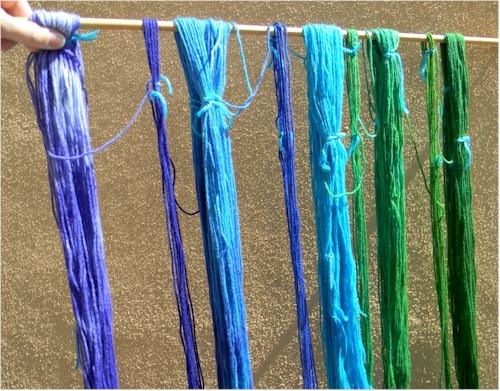 Class will cover choosing colors, basic dye preparation, various application methods, over-dyeing and heat setting. Please wear old clothes that you don't mind making a colorful artistic impression on, and non-slip shoes. Bring 1-2 skeins of white, cream, light grey or light pastel worsted or DK weight WOOL or WOOL BLEND yarn (no cotton) and note taking materials. Students may find a color wheel helpful. NOTE: Yarn should be in skein format. Students with balls of yarn should arrive at the store 30-45 minutes before class to meet with instructor to re-skein yarn. Instructor will provide handouts, gloves, tools and dyes.